This is the kind of cake batter I love to make. It's my kind of hands-on baking therapy that involves plenty of whisking and stirring. A lot of the magic is in the brown butter. It gets stirred into the cake batter at the very end. The specks of deep golden brown blends so well with vanilla beans, both in appearance as well as flavor. I used half a vanilla pod for my 6-inch cake. I actually tossed in an extra half teaspoon of vanilla extract for good measure but you don't have to do that. I was feeling remorse for not using vanilla sugar in this recipe. I keep a jar of it in my pantry but I have to tell you...I almost always forget to use it until after the fact, as was the case here! The brown butter contributes a lot of richness, as does a touch of cream (less than 3 tablespoons in my half-recipe). I happened to have some cream in the fridge to use up so it was very convenient. I also have amaretto and added a spoonful (the impact isn't all that noticeable...the flavors meld together). You could also use dark rum but leave out the alcohol altogether if you prefer. This cake is a good make-ahead option. Dorie recommends wrapping the cake up and giving it an overnight rest so that the flavors have a chance to deepen even more. As you know, I sliced my cake in half and added chestnut cream (often labeled "creme de marrons") between the two layers. In my mind, I thought maybe I was defeating the purpose of this type of simple French weekend cake by doing that. In the end, I wanted to try it because the flavors go so well together in my opinion. Moreover, it doesn't require much more effort than a quick slice and spread of some jarred chestnut cream. Admittedly, chestnut cream isn't easy to find here in the U.S. but you can order it online. I just ordered myself a jar recently since my stash from Paris (where it is as common and as readily available as peanut butter or Nutella is here) has sadly been depleted. Maybe one day it'll catch on here in the States one day...you never know. I think the sweet, nutty flavor of the chestnut cream goes really well with this buttery, nutty cake. That said, the cake itself, without the chestnut cream filling, is certainly moist and flavorful enough all on its own. I hope you're having a wonderful weekend...all the better if there's some cake involved! * I divided the original recipe in half and baked it into a 6-inch round cake. I also split the cake into two layers and added a layer of chestnut cream. You can double the recipe (to the original) and bake the cake in a greased 9x5 inch loaf pan for 55-65 minutes, or until a tester comes out clean. The cake is quite flavorful on its own, without a filling. Set a rack in the center of the oven and preheat it to 350 degrees. Stack 2 baking sheets one on top of another and line the top one with parchment paper or a silicon baking mat (alternatively, line an insulated baking sheet if you have one). Spray a 6-inch round cake pan with baking spray, or grease and flour it. Set pan on the baking sheets. Brown the butter. Place butter into a small saucepan and bring it to a boil over medium heat. Swirl the pan occasionally. The butter will bubble and sizzle. Continue until it turns a deep honey brown and you can smell an aroma of caramelized hazelnuts. Keep a close eye on the process since the butter can go from dark brown to black (burnt) very quickly. Put sugar into a large bowl. Add the vanilla bean pulp and rub the two together until the sugar is moist and fragrant. Whisk eggs into the sugar, beating for about 1 minute or until thoroughly incorporated. Whisk in the heavy cream, (if using vanilla extract instead of vanilla bean pulp, whisk it in now), followed by the amaretto or rum, if using. Use a large rubber spatula and gradually stir in the dry ingredients until a thick, smooth batter forms. Fold in the brown butter (including the dark brown specks) in 2 or 3 additions. Scrape batter into the prepared pan, smoothing the top. 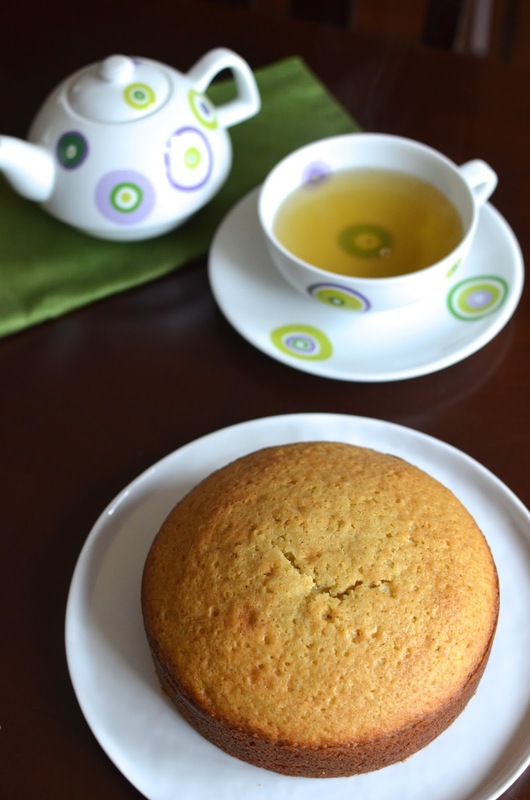 Bake cake until a cake tester inserted into the center comes out clean, about 35-40 minutes. Check the cake about 25-30 minutes into baking to see if it's browning too quickly. If so, cover it loosely with a foil tent. Remove cake from oven when ready, let it cool 5 minutes on a wire rack before removing. Turn the cake out of the pan and let cool completely right side up. If possible, wrap the cooled cake in plastic or foil overnight to allow the flavors to deepen before serving. To fill the cake, split it in half horizontally with a serrated knife. Spread the chestnut cream evenly on to the bottom layer and place the top layer on top of it. Same here! The whole 'weekend cake' moniker has all sorts of appeal to it! We're not eating this cake right now (since it's all gone) but I did make another cake today! I love cutting and sharing a cake with my family. : ) I love chestnut cream...it's like those delectable candied chestnuts in creamy form. It's great as a spread for warm crepes! This is such a pretty and elegant cake. I can definitely see why it was finished before the weekend. I can just imagine how amazing the brown butter and chestnut cream taste together. Sounds so perfect to enjoy with a cup of tea and browse through maybe some cookbooks. I can't believe how many there are that I want right now too :) Hope you guys had an amazing Halloween and enjoy the weekend! Thank you for saying that. I didn't do a very great job at it but it's a weekend cake, meant to be low maintenance, right! : ) The chestnut cream works really well with the brown butter and vanilla. And it's great there are so many great books out right now but it's true about wanting too many of them! I would love to try this. The chestnut cream sounds delicious! You have me at chestnut cream, Monica. This is my kind of cake, simple yet complex in flavour. Thanks for sharing, Monica, and enjoy your weekend! I absolutely adore chestnut cream! I can eat it by the spoonful-marron glaces included too! :D What a lovely looking cake Monica! And you have me curious as to what chestnut flour tastes like! I love marron glaces too but they are so expensive even when I can find them. Thanks, Lorraine. so many cookbooks! Tis the season, and it always makes my christmas list longer, for sure. :) This looks lovely! And i love the addition of the chestnut cream: you just don't see it used all that often, and i bet the flavor combo is delicious. Yes - there is such an overflowing abundance of books out...we will all be so busy cooking and baking in the next 2 months! I have never tried chestnut cream, but now I am intrigued. I love Dorie's recipes as well. This looks like the perfect little weekend cake! Thanks, Natasha. I hope you give it a try one day. Grab a jar or tube or cantainer if you ever spot it. I am so inspired by this year's cookbook season also!! It seems like all of my favorite cookbook authors are coming out with new books. I haven't gotten my hands on Dorie's yet, but after hearing your review, I'm going to order it off Amazon! Inspired is so right! I am honored to have possibly affected your cookbook buying selection, Joanne. : ) You know Dorie is a great bet! I know I feel the same about fall cookbooks coming out!! I just ordered seriously delish and am waiting for it impatiently!! This cake looks real good! I wish I could have some sort of cookbook library because I see so many good ones! Hope your book comes real soon and you love it! I love all the chestnut recipes that you share this time of the year! This cake sounds fantastic. And speaking of chestnuts I still need to get my hands on some. It never happened last year! Thank you so much, Ashley! : ) I made a batch of chestnut soup last week (after x'mas last year, I scored 3-4 jars of chestnuts from Williams-Sonoma for a steal!!) and I've got chestnut on my mind constantly now! I hope you munch on some chestnuts at some point this winter. It'll be perfect with your tea in front of the fireplace! I must give chestnut cream a try sometime - it sounds amazing. And speaking of amazing, what a great recipe! I think I'd finish that cake in record time, too. I want to try almost every one of those cookbooks you mentioned! What a great season for new recipes. 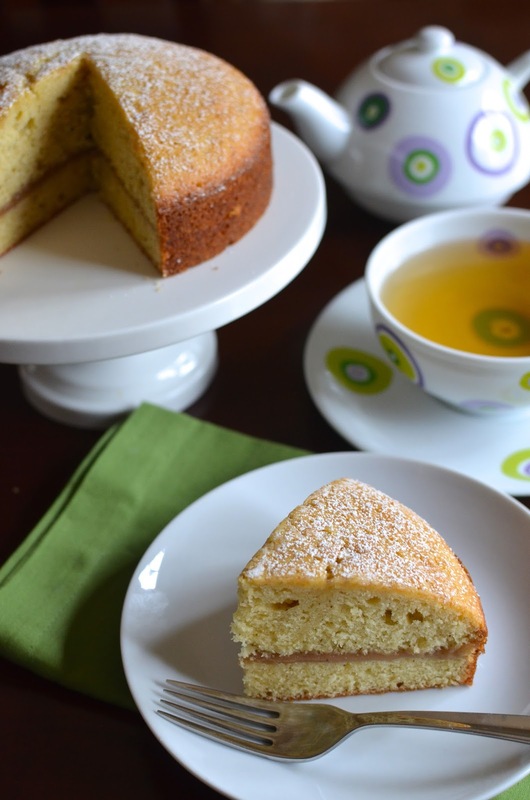 This cake is so simple but so packed with flavor. The French are very smart with their eating. Hi Monica, this book is high on my list, everything I have ever baked of hers has always turned out well. The chestnut cream sounds amazing, love this recipe! I don't really buy cookbooks so I don't know which ones are published, when? However I do love Ina and Martha. Dorie Greenspan is new name for me, i would love to read her recipes as you said they are not complicated and are well described. This cake looks beautiful and I bet it tastes delicious with chestnut cream. Thank you! I am just loving all the cookbooks at the bookstore right now. I think you'd like Dorie's recipe...very detailed and filled with advice. Have a great week! There are so many cookbooks this fall. It looks like it's cookbook season! l need to get Doris' book. This cake looks amazing. I know - loving all the wonderful cookbooks...it's just amazing. That cream filling certainly made me drool! Monica, I love chestnuts, but have never heard of chestnut cream! You definitely have peeked my interest, and now I can't wait to get my hands on some! I'm so glad you linked to a picture of it, because now I know what to look for! Pinned! Hi Kristi - it's really rare to find chestnut cream here in the States. I bought a bunch when we went to Paris on vacation (it's really inexpensive there) but it was not enough! I'm glad you found it interesting and I hope you give it a try one day...a jar keeps really long in the fridge, which is nice. Hey Jo!! Vacation sounds wonderful! Hope it was a great time...thanks for stopping by! I love the idea of brown butter in the vanilla cake...and yes, chestnut filling just sound and look fabulous...great looking cake. Yes, it's a great combination and I was relieved the chestnut cream filling worked well with it all. Thanks, Juliana. I bought little 6" layer pans for a three layer cake I made for my daughters birthday, and thought I would never use them again, until you started providing wonderous little cake recipes, Monica! The smaller size is just perfect for dessert without the temptation to eat more and more. Vanilla is my favorite flavor and I always double the vanilla in everything. This cake sounds like my idea of cake heaven. The fact that the flavor improves with an overnight rest makes me think that, in loaf form, it might make a great care package cake too! 6-inch pans are wonderful because you can essentially divide regular cake recipes in half. I agree on vanilla, too. I feel like you can never put in too much. A loaf cake is what this was intended to be. It would definitely make a great care package! Oh chestnut spread filling!!! I didn't know there is canned chestnut spread. Chestnut desserts just aren't popular in the US. Most people don't even know what a mont blanc is. I do miss that nutty and sweet chestnut cream. The powdered sugar is a nice touch on the cake. Looks beautiful! Oh yay for another chestnut fan! : ) I went to Eataly thinking they would have it but they didn't - can't find it hardly anywhere here so I now have to order it. In Paris, chestnut cream is everywhere like we have PB here. And plus, so inexpensive...sigh...should have bought more. I love them in financiers and in crepes. If I had more of it, I'd just spread it on toast! It looks great. Beautiful flavours and a lovely looking cake. Lovely! That cookbook is going on my wish list...it looks awesome! And this cake sounds amazing! It is a great book! Thanks, Sara. 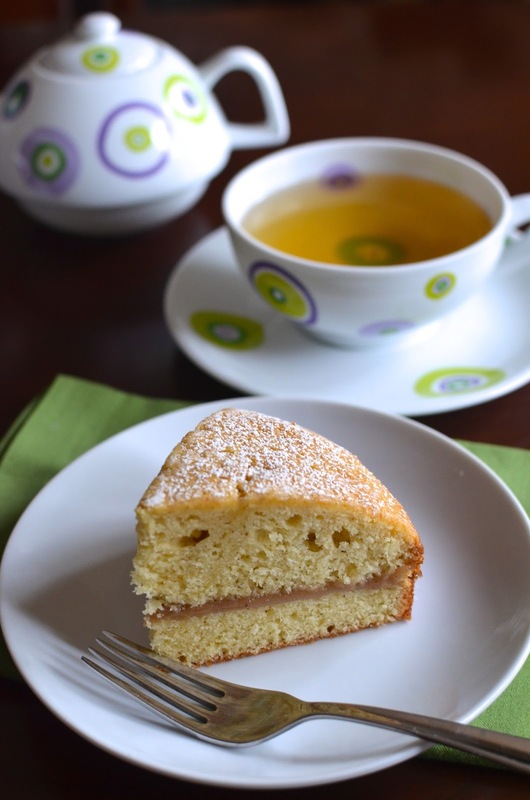 Yummm, the chestnut cream filling sounds like the perfect touch to this weekend cake. Plus the fact that there's a make-ahead option, which is always handy (: And whoa I didn't know starbucks had a Cheestnut Praline Latte, but it sounds delicious! I just tried the chestnut praline latte on Sunday on our way back from a little road trip. I was excited that a 'preview' was available. Long story short, it tastes heavily like hazelnut - more a hazelnut latte. I liked it but it isn't exactly something I'd be craving.